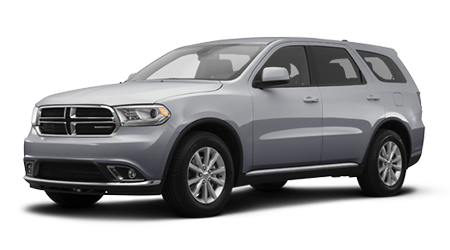 If you are looking for a rugged, capable three-row SUV, look no further than the 2015 Dodge Durango. Sulphur Springs Chrysler Dodge Jeep Ram has the Durango in all trim levels, and we're ready to serve drivers from the Tyler and Greenville, TX areas. The 2015 Durango comes with either a 290-horsepower, 3.6-liter V6 or a 360-horsepower, 5.7-liter Hemi V8. All Durangos feature an eight-speed automatic transmission, four-wheel disc brakes, traction and stability control, and trailer sway control. Properly optioned, a V8 Durango can haul a 7,400-pound trailer (6,200 pounds with the V6). Rear-wheel drive is standard fare, but all-wheel drive is available, even the sporty R/T. Durango trim levels allow you to option it from a hard-working SXT to the luxurious Citadel edition. The base Durango SXT starts out with three-row seating for seven, 18" alloy wheels, three-zone climate control with rear vents, cruise control, and six-speaker sound system with Uconnect voice controls, Bluetooth, USB, and auxiliary audio input ports. Step up to the Limited trim and get remote start, leather upholstery, heated rear seats, six-way power adjustable passenger seat, 110-volt outlet, and 8" Uconnect touch screen infotainment system with voice recognition, internet radio, and more. A Rallye package is available on both SXT and Limited with 20" wheels and sporty exterior trim. Limited buyers can also option a Safety, Security and Convenience package, with all the latest electronic aids, or a Premium package with power liftgate, 20" wheels, sunroof, navigation and a ten-speaker Beats by Dre sound system. The Durango R/T is the sportiest model, with a lowered suspension and standard Hemi V8. The R/T also includes all standard Limited equipment, plus HID headlights, power liftgate, and the Beats stereo system. A sunroof and navigation are optional. A premium Napa Leather package adds special read leather seats exclusive to the R/T models, plus a few other features. The Durango Citadel has much of the R/T equipment, but more of a luxury focus. It doesn't come standard with the V8 and has the normal ride height. It does add automatic high beams and wipers, sunroof, and navigation. Optional on this and the R/T is the Technology package, which includes smart cruise control and blind-spot monitoring. Most Durango models can receive a special Blacktop trim package this year with 20" wheels and special high-gloss black exterior trim. A towing package is also available. If you need to tow large items with the whole family on board, or are looking for a luxurious way to get to your hunting cabin in the woods, the 2015 Dodge Durango can do it. Sulphur Springs CDJR can put Greenville, Tyler, and Sulphur Springs residents in one of these stunning and capable models today.